Here we present the work of a team associated with the Center for Urban Epidemiologic Studies (CUES) at the New York Academy of Medicine. 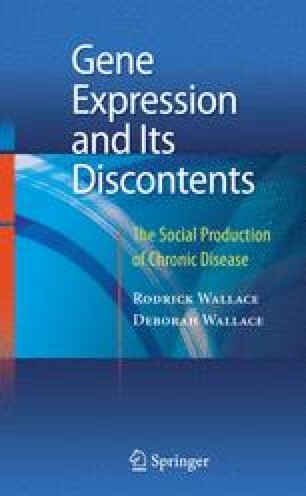 The principal author was Deborah Wallace, working with Dr. Sandro Galea, at the time, Deputy Director of CUES, and Jennifer Ahern, also then at CUES, who should be regarded as coauthors of the chapter. It focuses on patterns of HIV/AIDS and related deaths as a population/community level disease guild including homicide, drug deaths, and cirrhosis deaths. These data suggest the necessity of expanding the theoretical analysis of the early part of the book from a focus on individual paths of cognitive gene expression driven by epigenetic catalysis to emergent phenomena at the population level, necessarily involving coordinated crosstalk between individuals, subgroups, and perhaps geographic subdivisions.